Total distance: 1400 km (875 mi). Since international train travel with four bicycles is just a big mess, we took the plane from Berlin to Lyon and had the bicycles shipped to the airport. We arrived on a holiday in mid-May, and despite claims that the office would be open, "of course", it was closed and we spent the night in Lyon. It's a pleasant but unremarkable town. The next morning we got back to the airport, got our bicyles, and rode on route D75 to Vienne at the Rhône river. 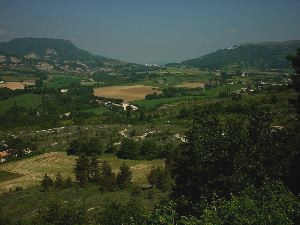 From here we followed N86 on the right side of the Rhône to Touyrnon and Valence, where we stayed for the night, halfway to Avignon on the left bank of the river. 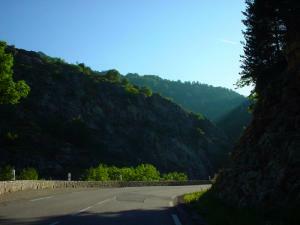 The left picture above was taken on the road to Valence, and the right on the way to Avignon. The next morning we got back to the right bank of the river, and continued our way to Avignon on N86 until Bagnols, where we turned left on N580 to Avignon. Most of the ride from Lyon to Avignon was on fairly busy roads, but bearable because most of the heavy traffic uses the A7 freeway which also follows the Rhône. 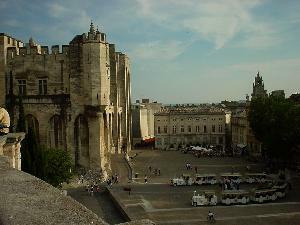 Avignon is known as the seat of the Pope for much of the 14th century, when unrest in Rome forced the Pope into exile. Sure enough, another Pope was found who stayed in Rome, and the church amused itself for some 70 years with sorting it all out. In the meantime, they couldn't very well put up the pope in a motel, so they built a new fortress and cathedral in Avignon, shown in the picture to the right. The main cathedral may be impressive, and they also put up some rather nice gardens, but it's really rather disappointing compared to the Vatican in Rome. While the front has massive walls and arcs and turrets and everything, it morphs into simple and unadorned utilitarian buildings in the rear. At least they have a beautiful view over Avignon and the Rhône from there. I can sympathize with the Pope for trying to get home to Rome asap. Still, the exile was a big boon for Avignon, which became, and still is, a major European cultural center. We couldn't find a hotel in Avignon, so we crossed the river at the palace and found the campground. We did get a room to ourselves in the hostel they run at the campground. It has all the charm of a deserted school building, but we got beds. Avignon is a wonderful town for walking around. 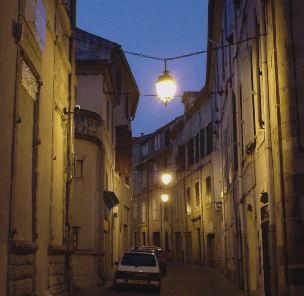 The picture to the left shows one of the numerous narrow streets lines with ancient buildings. It's also a major tourist destination, and the old downtown is pretty much packed with people, and numerous less than ancient shopping streets and tourist-oriented restaurants. 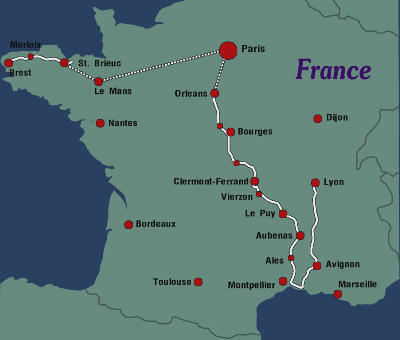 We left Avignon towards the Mediterranean, following first the Rhône and small roads thriough Arles and Aigues-Mortes, and finally reached the coast at le Grau-du-Roi. The roads were actually very nice and quiet, especially D179 which follows small channels much of the time, but when we finally got to le Grau-du-Roi we were greeted by a cheerless collection of concrete tourist hotels, gaudy shops, and a rather unappealing beach. We got into the water, took a few silly pictures, and turned around and got out of there in search of a place to stay. This clearly wasn't the France we were looking for, so we fled the next morning to get to the center of the Massif Central mountains. We had no intention of fighting our way through Montpellier, a major city in southern France, so we took D61 north. Although a secondary road, it carried very heavy traffic, mostly trucks. They promptly got backed up for many kilometers, so we could ride on the nonexisting shoulder (meaning dirt and grass, and a puncture) relatively unmolested. From Lunel all the way to Alès, traffic was much lighter, and the ride was mostly uneventful with no major sights. Alès is a quiet town at the southern edge of the Massif Central, France's central mountains. 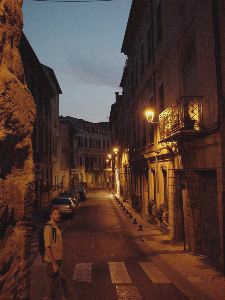 The picture to the right shows a street in downtown. We stayed the night in Alès and entered the mountains the next morning. The left picture was taken early in the morning, and the right one later, close to Le Puy. 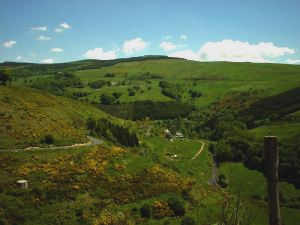 There are many small villages along the road, some capping small hills with steep rocky walls. 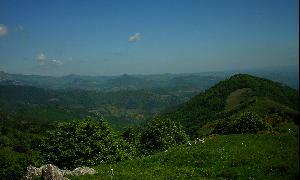 The Massif Central is not a mountain range with snow-capped peaks; it's very old and has only moderately high passes. The peaks are rarely over 1200 meters (4000ft) high. The mountains are also very green. This day involved the most climbing on this tour; the next two days would be hilly but did not involve major climbs. Le Puy en Velay is a small, almost sleepy town in the mountains. It has a very convoluted monastery complex that is very easy to get lost in. I can attest that it's difficult to reach an ice cream store on the western end if you happen to be in the church on the eastern end. 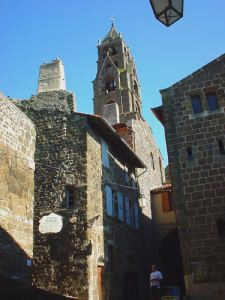 The picture to the right shows the bell tower of the church. The next morning we left Le Puy to the north, following the scenic D103 along the Loire river until Retournac, where we turned west on D9 to Craponne-sur-Arzon and Arlanc. Except for the last stretch on D906 we had only light traffic. 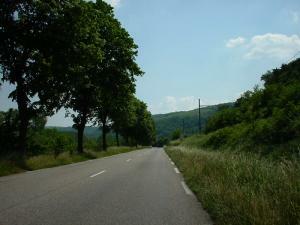 There are much shorter roads between Le Puy and Arlanc, but they would not have been nearly as quiet and scenic. It was also interesting to see the beginning of the Loire, which I had followed from Orleans all the way to the Atlantic coast where it has become a wide river, on another tour. Our destination of the day, Arlanc, is a dying town. There is still a proud city hall and tourist information, and one remaining small private hotel where we stayed, but also many houses with doors and windows boarded up, or simply deserted. One almost expects tumbleweeds blowing through the streets. I later learned that the whole area we travelled through that day and the day before is losing much of its population because it has no economic future. It's perfect for bicycle touring. The final day through the Massif Central went from Arlanc to Issoire, on route D999. This was a short trip because it became clear that we would arrive in Clermont-Ferrand earlier than expected. The weather, which was sunny until now, was getting colder and threatening to rain. We therefore skipped our planned detour to Mont Dore, a ski resort up in the mountains south-west of Clermont-Ferrand, and went straight to that city. Clermont-Ferrand is a large town, with a large cathedral built from black volcanic stone, shopping streets for the tourists, and a large and well-maintained old downtown. Despite its size it was quite pleasant, although the weather had by now turned really cold. 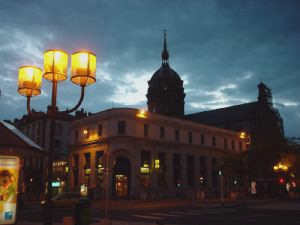 The left picture below shows Clermont-Ferrand, a building at the main square where we also found our hotel. The tourist office recommended a cheaper one that turned out to be right next to a freeway access ramp, and we decided that this is just no way to end a very nice vacation, so we started calling around asking for rooms in three-star hotels. It wasn't all that much more expensive. My friends left the next morning to return to Berlin, but I had a few extra days and continued to Orléans. Leaving Clermont-Ferrand to the north is difficult and there is lots of traffic, but it got much better after Riom, which is a kind of an industrial suburb of Clermont-Ferrand. I used small roads near D144 to Montloucon, and then the larger but quite scenic N144 to St. Amand. N144 is mostly parallel to the A7 freeway, and follows the Cher river. The weather had recovered and turned warm again. After St. Amand, I left N144 and followed the quiet and scenic D35 along the Cher to Châteauneuf, a beautiful little village on the river. It was getting late, so I found a little hotel in Châteauneuf. The right picture above shows one of the Cher river branches near my hotel. Although I was losing a lot of altitude that day, I still managed to set both distance and altitude gain records that day (and again on each of my other remaining two full riding days). 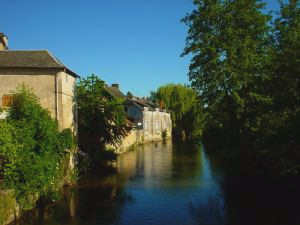 The next day I continued along the Cher, still on D35, which allowed me to bypass the city of Bourges. I left the Cher at Vierzon, and turned straight north to Orléans on N20. Although N20 is right next to the freeway all the way, and therefore does not carry much traffic, it was also not especially interesting. It passes through forests much of the time, with no hills or views. 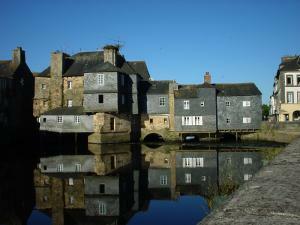 After arriving in Orléans, I went straight to the train station and sent my bicycle ahead to St. Brieuc, my next stop. I could have reached it by bicycle in two days, but that would have been two rather hard and un-scenic days, in the rain that was developing, and I wanted to stay these two days near St. Brieuc with my aunt and uncle who live there. Bicycles on trains in France are a complete joke. The train company, SNCF, will proudly show you their bicycle guide, but it turns out that they have a single train per week that accepts bicycles, and it starts late at night and arrives at two o'clock in the morning. They manage to hide this fact in the fine print. Truly useless. I therefore sent my bicycle ahead, and to my surprise it was actually delivered to my aunt's house in one piece two days later. I took the train myself, and since in France virtually every connection passes through Paris, this took longer than expected. Well, I made it, but I didn't have time for seeing much of Orléans. Doesn't matter, I have seen it before. 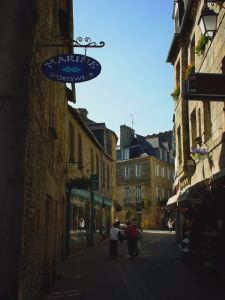 St. Brieuc is in the Bretagne (Brittany), which is near the north-western tip of France called Finistère (land's end). Since my flight back to Berlin left in Brest, which is large enough to have an airport, so I had to ride there from St. Brieuc. (Remember, the alternative would have been this idiotic Friday night train at two in the morning.) This is a long but very scenic ride. I decided to not follow the English Channel coast, which I have seen on an earlier tour, but go straight through the hilly and very rural center of Finistère. 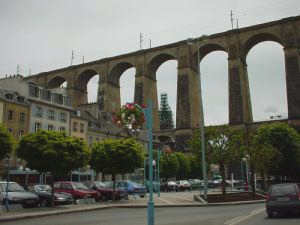 I stopped at Morlaix, a pretty little town dominated by a huge train bridge, shown in the left picture below. I continued towards Brest, but I know Brest and didn't want to stay there overnight, to catch my flight at noon the next day. So I went through Landivisiau to Landernau, a pretty little town close to Brest where I found a private bed-and-breakfast on top of a hill overlooking Landernau. The right picture above, and the picture to the left shows the buildings that bridge the Elorn river arm of the Atlantic that begins in Brest, and a street in Landernau. It turned out that the airport in Brest is tiny, and I couldn't check in the bicycle until two hours before the flight. So I turned back and rode into Brest, for lack of a more interesting destination. Brest has a few nice places, but it's mostly a waste of time on ugly streets with heavy traffic.